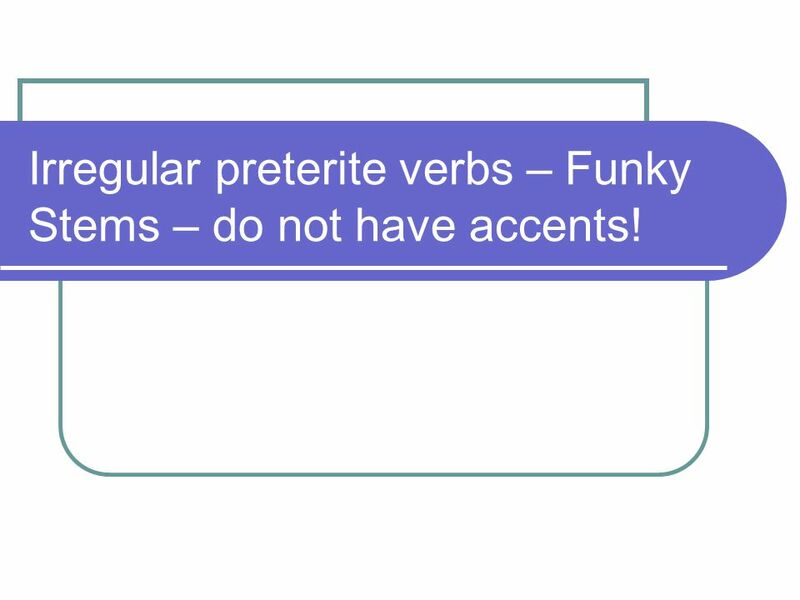 3 Irregular preterite verbs – Funky Stems – do not have accents! 5 Practiquemos Mis amigos anduvieron por el parque. My friends walked through the park. 2. 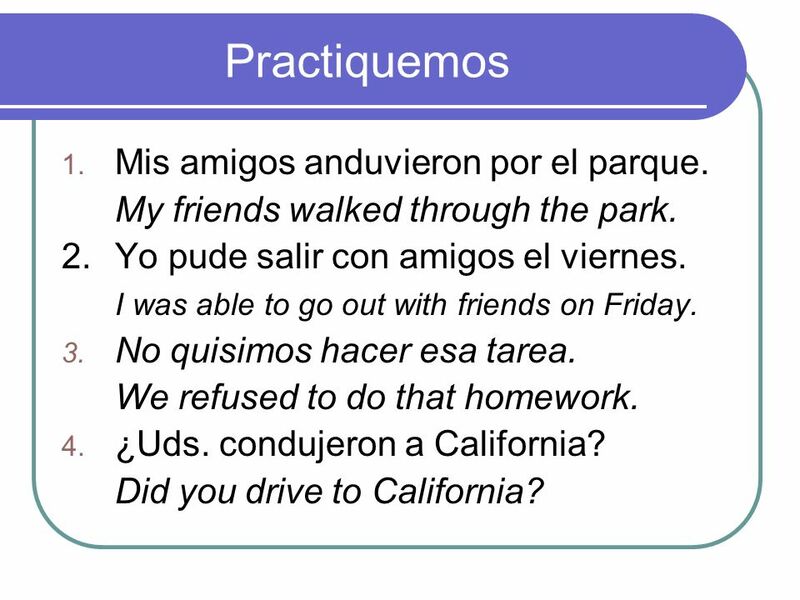 Yo pude salir con amigos el viernes. I was able to go out with friends on Friday. No quisimos hacer esa tarea. We refused to do that homework. ¿Uds. condujeron a California? Did you drive to California? 6 ¿Dónde pusiste aquella comida? Where did you put that food? Elena tuvo que volver a la biblioteca. 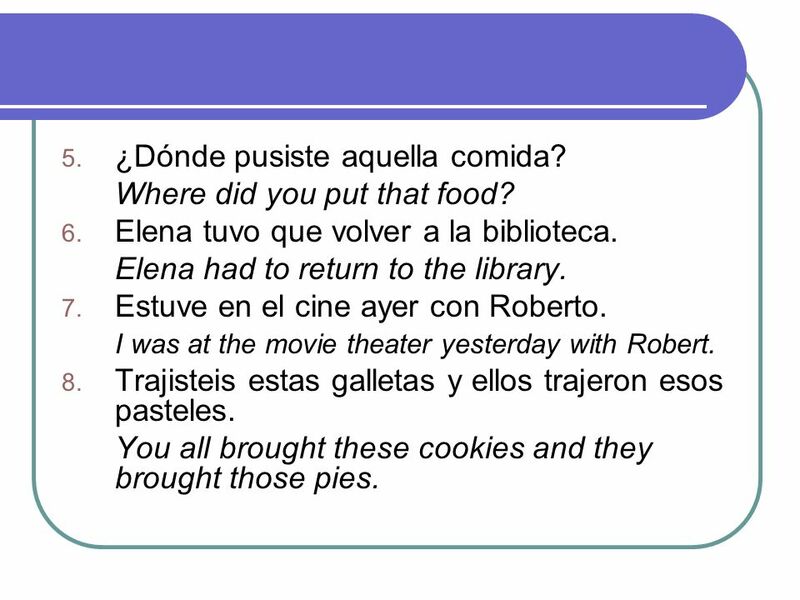 Elena had to return to the library. Estuve en el cine ayer con Roberto. I was at the movie theater yesterday with Robert. Trajisteis estas galletas y ellos trajeron esos pasteles. You all brought these cookies and they brought those pies. 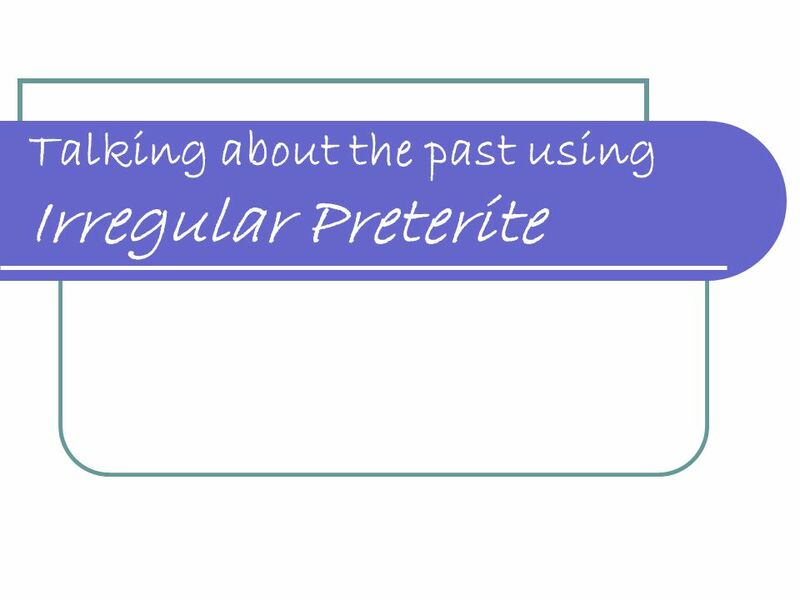 Download ppt "Talking about the past using Irregular Preterite"
IRREGULAR VERBS IN THE PRETERITE By:Sr.Smith, Sra.Huntley, Sra. Carroll. El futuro El Futuro Irregular. How do I talk about a specific past action or event? El Futuro Los Irregulares. Regular endings é ás á emos éis án. TIME : Refers To Specific, Completed Past Actions. 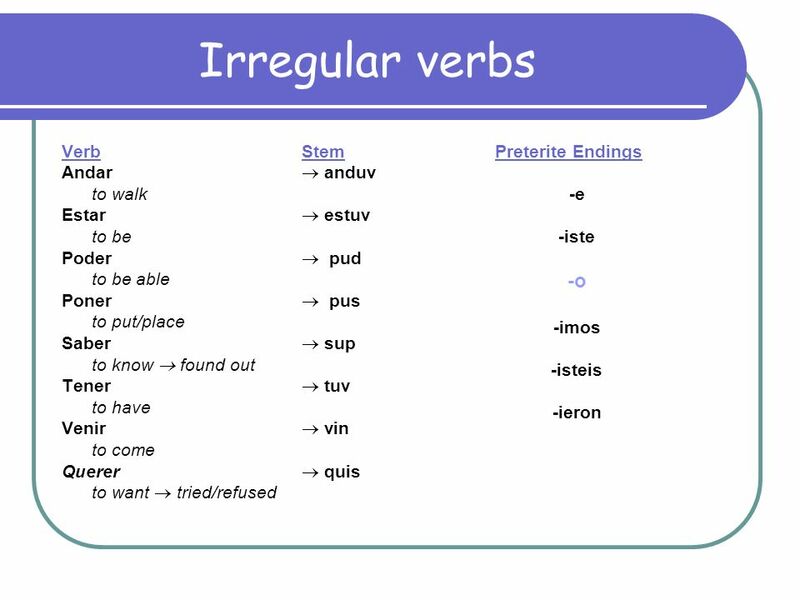 Verbs + el infinitive. 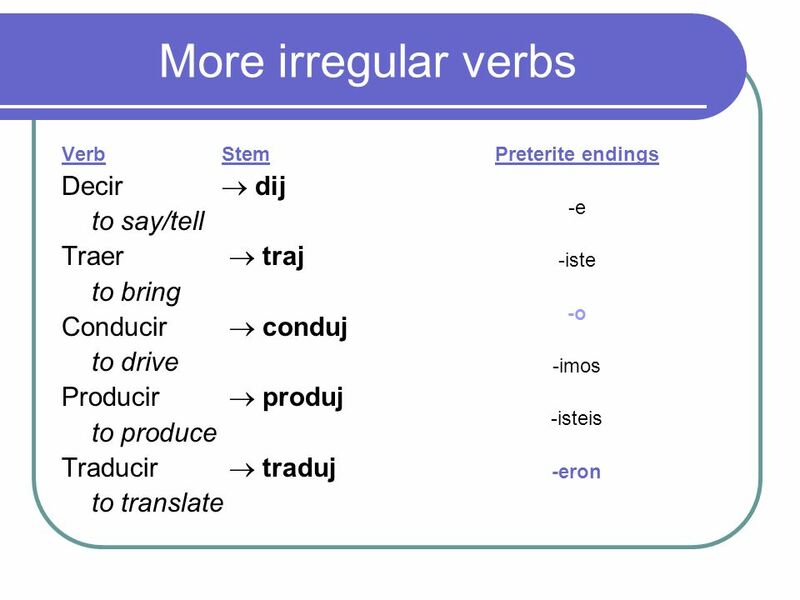 Infinitives verbs that are not conjugated end in –ar, -er, or -ir. 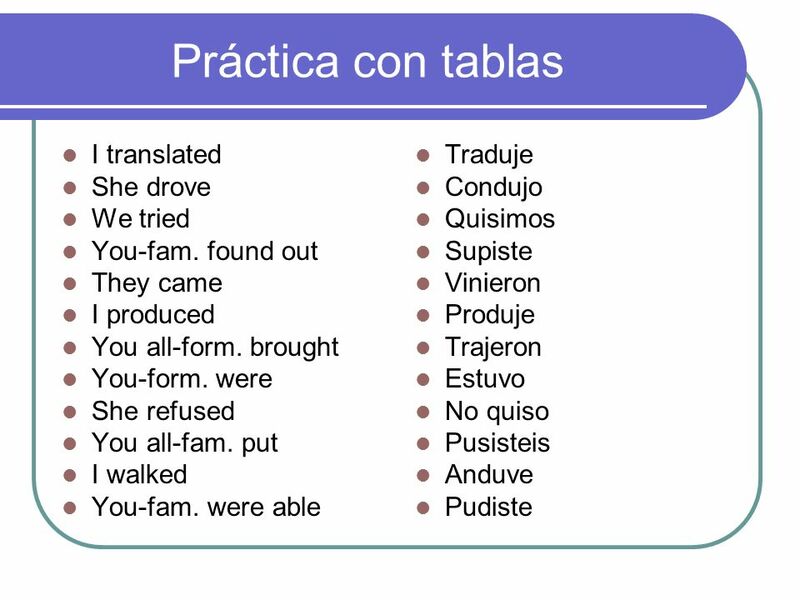 Repaso del pretérito el 11-16 de enero.